Motto: "Do You Remember When"
The ship was named in honor of a Lieutenant Commander John Rich Craig who was the commander of the USS Grampus SS-207, a submarine lost in the southwest Pacific during World War 2. The keel of the Craig was laid November 17, 1944 at the consolidated Steel Corporation in Orange, Texas; she was launched on April 14, 1945 and completed on August 20, 1945. She was 376' 6" long; 40' wide : displaced 2425tons (3479 to 3520 tons full load). She had speeds of 34+/- knots. Her guns were, 6 - 5"-38 (3 twin mounts), 16-40mm, 20-20mm, 5 torpedo tubes, 3K Guns port and starboard, Depth charge racks port & starboard off the fantail . Machinery geared turbines - 60,000 S.H.P. - Boilers 4 radius 5,800 miles at 15kts. Complement: 257 (Peace), 350 (War). Following her commissioning August 30, 1945 she joined the U.S. Fleet for operations by Lester C. Cornwell as her first Commanding Officer. After shakedown in the Caribbean the Craig departed from Charleston, SC in January 1946 for San Diego, CA. Her initial assignments were with the occupation forces in Japan. She departed San Diego the 7th of February 1946 to join the 7th Fleet and assist in repatriating Japanese soldiers from North China returning to San Diego January 31, 1947. Prior to the Korean conflict the John R. Craig alternated Far Eastern deployments with periods of intensive training off the California coast. The Craig first saw action when the Korean conflict developed in 1950, arriving in the combat zone in February 1951. Her duties ranged from plane guarding to naval gunfire support though she was designed primarily as an anti-air warfare unit. The destroyer performed shore bombardment in the Wionsan area knocking out enemy installations and disrupting transportation. Other than for two brief periods in San Diego, the Craig continued operations off Korea during the remainder of the conflict. During three tours with Task Force 77, she came under hostile shore fire several times earning the Korean Service Medal with four battle stars and the United Nations Korean Service Medal. Following the end of the open war in Korea in 1954, the Craig continued patrol operations south of the 38th parallel to insure peace in Asia. From 1954 to 1962 the destroyer engaged in exercises off the West Coast with annual deployment to the Far East. During the 1955 cruise the Craig took an active part in the evacuation of Chinese Nationalist from the Tachen Islands. Further cruises consisted of exercises with the Japanese Self Defense Force in 1957 and included a visit to Auckland, New Zealand, in 1958. Local operations consisted of Midshipman cruises, Fleet exercises and Type training. In 1962 the Craig was sent to San Francisco and the Hunters Point Naval Ship Yard for F.R.A.M. which was (Fleet Rehabilitation And Modernization) Mark I conversion program. As a result of this extensive work the Craig was virtually a new ship above the main deck (aluminum superstructure). The differences in armament, facilities, and appearance were readily apparent. All birthing spaces were modernized and air conditioned; the bridge became a fully enclosed tactical, command and navigational space. The Combat Information Center or (CIC) was likewise redesigned to integrate and coordinate its functions of detection, tracking display, and weapons control. The 5"/38, 16-40mm, 20-20mm, 2 hedgehogs, 5 torpedo tubes and depth charge rack were removed. Another striking feature of the new Craig was the hangar and flight deck on the after portion of the ship. This unique arrangement originally provided facilities for the DASH system. A radar guided Drone Anti-Submarine Helicopter was employed to drop an anti-submarine weapon on the target at a considerable distance from the ship. The box-shaped ASROC launcher was placed amidships. This was designed to launch ballistic Anti-Submarine Rockets against submarine targets. It provided the ship with a long range capability. The more conventional torpedoes were relocated forward of the bridge for short range encounters, and two of the original 5"/38 caliber gun mounts remained as anti-air, surface, and shore target armament. The Craig is now 390' long, (additional 13'6") 40' wide and draws 15' of water; displacing over 3000 tons. She is powered by four oil-fired boilers which provide 60,000 horsepower to the twin propellers producing speeds in excess of 30 knots. The John R. Craig completed the overhaul March 13, 1963 and once again joined the Pacific Fleet. She sailed October 17 of the same year for duty in the Formosa Straits to deter Communist aggression. She returned to San Diego May 19, 1964 after patrolling the Formosa Straits, visiting Hong Kong; Subic Bay; Sasebo; Taiwan and Okinawa. She then operated along the West Coast until heading back to the Far East on March 6, 1965. John R. Craig conducted the first DeSoto Patrol in the Gulf of Tonkin. Participated in Market Time operations under both TF-71 when the Seventh Fleet ran the operation and later under TF-115 when CHNAVADVGRU Vietnam ran it. Craig was the first Market Time Surface, Sub-surface Coordination (SSSC) ship when it was decided someone should attempt to keep track of what was going on in the South China Sea off Vietnam. Expended 3,256 rounds while performing NGFS duties in the I and II Corps Tactical Zones in July and August 1965. When relieved by CTF-70 and CTG-70.8.9 on 12 August and when Topeka was no longer visible, we declared the Craig fantail a National Park and had a big cook out that included 25-cases of beer liberated from the Navy Exchange in Danang. Operations increased with rapid deterioration of the Vietnam situation. She left Sasebo on April 8th to screen the USS Midway CV-41 during the air strikes against enemy targets in South Vietnam, she remained on this duty until July 2. After a visit to Hong Kong, on July 20, 1965 she was designated flagship for a new naval gunfire support group. Her enemy targets providing gunfire support for U.S. operations ashore. Craig was an initial participant in what soon became a standard Cruiser-Destroyer Force operation. August 11 she headed home and arrived in San Diego one month later. Her service during that year won her the Battle Efficiency "E" for DesRon 1. * Two 7th fleet destroyers chalked up a first in the in-country operations Thursday night (July 22), when the USS Stoddard and the USS John R. Craig joined forces in a mass fire mission against a Viet Cong concentration in the I Corp area of the Republic of Vietnam. Mass firing is the firing of two or more ships on one target, with one ship using the computer solutions of the other. The ships fired over 40 rounds of five-inch high explosives into the target, a suspected Viet Cong assembly area in the CA DE Song River, about eight miles from the Danang harbor. * Immediate evaluation of the damage was not available, but a spotter reported "Very effective impact on the target." Weather in the area was clear, no return fire from the beach was reported during the one hour mission. This was the fourth night in succession that Stoddard has conducted shore bombardment from the Danang harbor. She has fired a total of 281 rounds during these missions. Stoddard's commanding Officer is CDR. Charles K. Presgrove of Chula Vista, CA. Craig is commanded by CDR. J.K.Jobe. After operations off Southern California she entered Hunters Point Naval Shipyard on December 1, 1965 for overhaul. Ready for action at the end of March 1966, she trained out of San Diego until sailing for the Far East on July 28, 1966. In August 1966 the Craig again distinguished herself when it was announced that the ship had won the Marjorie Sterret Battle Ship Fund Award. This award is given annually to one Atlantic and one Pacific Fleet unit which typifies the best ship of its type, based on competitive exercises and material readiness. Only one ship in each fleet can win each year, making competition keen and the award highly coveted. On September 13, 1966 she entered the Gulf of Tonkin for plane guard duty; ten days later she provided naval gunfire support for Operation "Golden Fleece" in Quang Nga; Province. Next came Operations "Sea Dragon and "Traffic Cop", interdiction of supply from the North to the Demilitarized Zone. During this duty she engaged enemy shore batteries and shelled North Vietnamese radar sites. 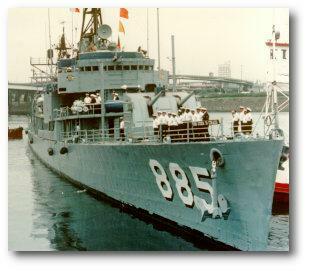 On December 4, 1966 she departed the Gulf of Tonkin and returned home early in 1967 to prepare for future action. The Craig departed San Diego for the Western Pacific on June3, 1969 en-route to Yokosuka, Japan; leaving Yokosuka on June 29 for Yankee Station ASW training area. After two days of intensive anti-submarine exercises she reported for plane guard duty with the USS Ticonderoga CV-14. On July 19 she headed for Subic Bay, Philippines Islands for upkeep where she was dry-docked for hull repairs. From Subic Bay she headed for the Southern II Corps area in the Republic of South Vietnam. The morning of August 7 she plunged into a tense situation, after more than sixty minutes of gunfire support her twin 5"/38 caliber gun mounts guided by an air spotted suppressed hostile fire enabling helicopters to pick up the Rangers while suffering no casualties. The Craig remained on station until August 22 firing at 289 targets during 48 missions. The ship was credited with 4 KIA's, 85 bunkers destroyed and 78 damaged, 95 meters of tunnel collapsed, 44 military structures destroyed and 11 more damaged, 17 secondary fires and 2 secondary explosions. This was her fourth tour of N.G.F.S. since 1966. Craig headed for San Diego on October 19 to arrive there on November 3 1969. Of the four and one half months in WESTPAC, only a total of one month was spent in port. On October 26, 1970 the Craig was underway for her nineteenth deployment to the Western Pacific, Departing Pearl Harbor on November 6 en-route to Subic Bay arriving on November 19 and returning to sea the following day on our way to Yankee Station on the 21st. December 16th was spent recovering wreckage of a C-2A that had crashed on takeoff with ten people aboard with no survivors. December 18 to Subic Bay for a week of upkeep and preparations for New Year's on the gun line. On January 4, 1971 she departed the gun line heading North to the city of Kagoshima, Japan; from there on the 15th she proceeded to Sasebo, Japan for thirty days patrolling in the Sea of Japan. On Valentine's Day she left Sasebo en-route to the Gulf of Tonkin via the Taiwan Straits to Hong Kong for a week of shopping and touring. Rest and Relaxation ended on March 2 the Craig went on the North Search and Rescue station in the Gulf of Tonkin, scheduled for four weeks but cut to two and sent to Subic Bay for upkeep. The eleven day stay ended at the eleventh hour; after a quick turn around and hurried planning on March 19 she was headed for four days of rescue destroyer duties. On 25 March, she took up station off the coast of the II Military Region of the Republic of Viet Nam for her second gun line tour of this cruise and the last line period before heading home. As the gun line period ended, six observed missions of thirteen total credited the ship with 28 fighting positions destroyed or damaged, 1600 meters of supply trails interdicted, and 2 secondary fires. The last round was fired on the evening of 1 April; on 16 April JOHN R. CRAIG departed Subic Bay and following brief fuel stops in Guam, Midway, and Pearl Harbor, returning home to San Diego on 22 April 1971. In November 1971, she again departed San Diego for WESTPAC and didn't return until 20 July 1972. The actual period of time spent in the "combat zone", as documented for " Hostile Fire Pay, was 15 December 1971 to 26 June 1972. During the deployment, the ship visited Hong Kong, Bangkok and Singapore. Not long after the Bangkok visit, she began a string of bad luck, which encompassed three Sundays in a row. The first "bad luck Sunday" was 25 February 1972, when the ship was steaming around Da Nang harbor conducting gunfire missions against land targets. A mission was scheduled for the morning hours, and another for afternoon. The spotter was a Navy LCDR spotting from an Army H-l 'Huey' helicopter. Before the morning mission, the Huey brought to the ship the South Vietnamese general in charge of the region and his staff, as well as the US Army I Corps colonel and some of his staff. They were to observe the morning firing mission, have lunch onboard; then observe the afternoon mission. In the morning, the Fire Control Director Officer and the GMGC departed aboard the Huey to observe the spotting part of the mission as "cross-training". The Plotting Room Officer and an FTI were scheduled to do the same for the afternoon mission. After lunch, however, the RVN general decided to return to the beach. When the helo took off, its tail hit the ship's structure and the helo crashed, upside down into the water. The ship managed to rescue three survivors: the USN spotter, the pilot, and a door gunner. The following Sunday, 2 April, the ship suffered another tragedy when FA Thomas Muren was lost overboard in the northern part of the Gulf of Tonkin. He wasn't reported missing from his watch station for some time and the subsequent search by JOHN R. CRAIG and other units was fruitless. The next Sunday, 9 April, the ship was somewhere near the southern edge of the DMZ conducting NGFS operations. She was supposed to have been on the way to the Battle of the Coral Sea celebrations in Australia, but those plans evaporated when the North Vietnamese Army invaded across the DMZ. The ship was to fire the main mission against an inland target and another destroyer (USS Rowan) was to fire counter battery if needed. The intelligence was that there were 'one or two' South Vietnamese coastal defense sites that had been overrun by the NVA and might fire on the ship. Because the primary target was well inland, the ship was pretty close to the beach and only doing about three knots. This was also the first time during that deployment that she was firing a NGFS mission while at General Quarters rather than at a Condition II Blue/Gold posture. This turned out to be very fortunate; it's not clear whether the ship got any rounds off before a bunch of coastal defense sites opened up on her. The ship started to race away from the beach. In the words of LTjg Wayne Braunstein, the Plotting Room Officer, "I could hear over the sound-powered phones the Director Officer reporting enemy rounds splashing to port and then to starboard and we knew we had been bracketed". Then we felt a shudder as a round hit. One of the rounds that hit us penetrated the fantail and, we lost the train control of the aft (5") mount. We also heard reports of a fire in After Steering, temporary loss of steering control, and flooding in, I believe, B & M berthing compartment (which was below the waterline). These were bad enough, but when I heard "Fire in the ASROC Magazine" I really began to worry. Since I was the ASW Officer and since the Plotting Room couldn't do much with the aft mount out of the action (the Director Officer was controlling counter battery fire with the forward mount), I requested and got permission to head for the ASROC deck. Arriving there, I dismissed the ASROC sentries, who, incredibly, were standing around the launcher with pistols out! The rounds that struck the magazine apparently jiggled the doors and set off the security alarms and someone called away the nuclear response team. Then I saw two Gunner's Mates exiting the forward door of the magazine with C02 bottles. They told me the fire was out, and we went back in to check. There were gaping holes in the top and bottom aft comers of the magazine. All of the torpedoes, stored in the magazine's aft section, were hit by shrapnel; in some cases there were inch-deep gouges in the warheads. Fortunately, the ASROC rocket motors, only a few feet further forward, were untouched. As we gazed up at the hole in the magazine top comer, a fire nozzle suddenly appeared as the After Damage Control Party reached the magazine after handling the After Steering fire. We just barely kept from getting hosed down! Coming back out to the ASROC deck, one of the GM's showed me where a piece of shrapnel had struck a window rivet on the ASROC Launcher Control Station. The rivet was propelled across the inside of the station just between the two Gunner's Mates stationed inside, and shattered a clipboard hanging on the opposite bulkhead. I also remember the First Class Signalman standing on the Signal Bridge, pointing up, and yelling something like, "Look what they did to my halyard!" It seems a round went right over the Bridge (the bridge watch saw it go by) and parted a halyard, greatly upsetting our signalman." "All of this only took a couple of minutes, and then we noticed some popping sounds. I looked to starboard and saw the ROWAN only a few hundred yards away racing parallel to us. Between us were all these strange splashes in the water. We were still under fire and had completely forgotten about it! We rushed into the Dash Hanger for safety and found this wasn't such a great idea. The hangar door was open and we could see flashes on the coastline from the guns firing on us. We found the After Lookout in the hanger; the round that hit the top aft comer of the magazine hit only 12 feet or so from his post and he was only saved by inflatable life rafts and the motor whaleboat cover that shielded him. The life rafts were shredded and it was a flare from one of them that fell into the hole in the magazine and was the extent of the magazine fire." "By this time, we were safely out of range and could explore the damage. A piece of shrapnel penetrated one cell of the ASROC launcher, crossed the interior where a rocket motor would normally be, and exited the other side. It was the only empty cell in the Launcher! The bulkhead around the after-steering watch's station was peppered with shrapnel; the Watch himself didn't get a scratch. A round had hit on the deck edge on the portside of the fantail. The shrapnel was directed into what I think was the E & R berthing compartment and ripped most of the lockers and bedding to shreds. If we had been at " Blue/Gold, half of these divisions would probably have been in their racks. Another round had-hit tight at the waterline on the portside, just above a fuel tank, and caused the flooding in B & M compartment." "We went into Da Nang for repairs. A lot of stereo equipment purchased in Subic had been stowed in a supply locker below the flooded compartment and was soaked with saltwater. An assembly line was set up to run this equipment through the showers, dried by all the hair blowers that could be found, and cleaned by the various electronics ratings on board." The remainder of the deployment was uneventful except for a change of command and a visit to Singapore, during which the ship dipped across the equator on 17 May. The crew of JOHN R. CRAIG received the Meritorious Unit Commendation as part of CTF 115 during this deployment and the Combat Action Ribbon for the 9 April action. The next deployment to WESTPAC was from January 1973 to June or July 1973. The ship arrived in Subic the same day, or close to it, that the peace accord was announced. The ship saw no more action, but the crew still received Hostile Fire Pay for February through May. Ports visited by JOHN R. CRAIG during this deployment included Hong Kong Kaoshung and Keelung, Taiwan, and Sasebo, Japan. The ship expected to be in the Sasebo shipyard for only a few days to fix a rudder problem, so the crew all went ashore and spent all their money. Then the Air Force or somebody lost the part being shipped from the States, and the crew was in port much longer without much money. USS JOHN R. CRAIG was transferred to the Naval Reserve Force (NRF) some time in 1974 and was stationed in San Diego. CDR John Wade Procell, USNR picks up the story: "I believe we were attached to DESRON 23[ed: DESRON 27]. I reported to her in February 1978 as an Ensign fresh out of OCS. At the time, the XO, AI E. Schmoker was acting CO. The previous CO had recently had a heart attack. At this time, CRAIG had 13 officers and approximately 245 men. There was a reserve detachment permanently assigned to the ship since she was NRF. They drilled onboard once a month and did two weeks of active duty onboard each year." "We performed the same duties an active ship did with the exception we did not deploy overseas. We did NGFS training with Marine spotters on San Clemente Island and often acted as plane guard for the various aircraft carriers stationed in San Diego. The ship was placed into stand down and eventually decommissioned after the hull cracked during an NGFS exercise off of San Clemente Island. We fired 600 5/38" rounds during a three day period. After x-raying and inspecting the hull, it was discovered that the hull was so badly worn, that patching the hull was impractical and the decision was made to decommission her." "She went into final stand down on 11 June 1979. The decommissioning ceremony were held 27 July 1979. Mrs. Craig was the guest of honor for the ceremony. It was my privilege to be the last watch officer and make the final entry into the deck log of the USS John R. Craig: Watch Secure". John Wade Procell, CDR USNR. JOHN R. CRAIG was stricken from the Navy Register 27 July 1979. Her final service to the nation was to be sunk as a target off the California Coast on June 6, 1980. The Information contained here has been obtained from a number of sources, including but not limited to Cruise books, family grams, shipmates and Naval History. We anticipate this information to be accurate. We realize this is not complete and would ask anyone who might have additional info on the Craig to send it to us.